Since the launch of Faune-France in July 2017, the French contribution to the EBP project has drastically increased. Most of the territory is now covered by the national portal, partnership with new nature protection NGOs was greatly developed and the number of data collected in the last 12 months now reaches 10 millions! But the main French revolution is still in progress. France has undertaken a deep transformation in the way birds are recorded. While most of the data were collected as casual records, birders are now invited to record their observations as complete lists. This makes their contributions even more valuable to science and biodiversity protection. Since the beginning of 2018, about one fourth of all the data collected are now recorded in lists, making it possible to evaluate the time spent by naturalists in the field and to get a better idea of what species are present and absent in a place at a particular time. 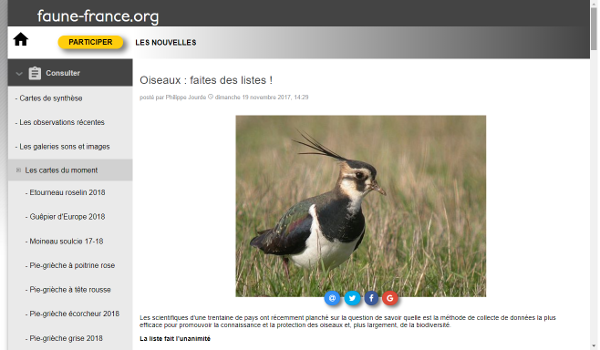 New surveys, based on list recordings were promoted in 2017 and 2018 such as the EPOC (Estimation of common birds population), that reinforce the French Common Bird Survey. Other promoting tools are still in development. They will soon contribute to reach the short term goal that the Faune-France team has in mind: half the data collected by complete lists. Currently, Faune-France collects 25% of the data as complete lists: a big step forward!